There has been severe weather recently. Just not across Northern Illinois and Southern Wisconsin. 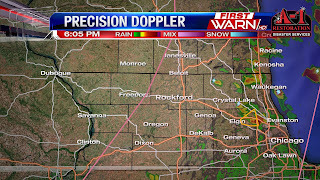 The strong thunderstorms through the last week or April were confined to areas south and southwest of Rockford. The temperatures on Saturday evening provide a very good explanation as to why that has been true. It is much warmer just to our south in the southern half of the state into Missouri, Arkansas, Kentucky, and Tennessee. Those states, along with the Plains states, have seen plenty of severe weather recently. That is because of the track of recent low pressure systems and the placement of their associated frontal boundaries. The lows of late have developed in the Rocky Mountains and shifted east towards Illinois, but have generally remained just south of our area. That keeps us in the "cold sector" of the systems, which means no thunderstorms. If those lows were to move further north -- a pattern that is more common this time of year than what we are seeing now -- then we would be in the "warm sector" like the states to our south have been. As a result, severe weather would be happening more often. Also, on a few occasions a boundary has moved through the area, but stalled just to our south. Add that boundary, which is keeping us cooler here in the Stateline, with low pressures that track south of here, and you get a lack of thunderstorms and severe weather. The cool temperatures are the reason behind a lack of severe weather here in the northern half of Illinois. One of the variables meteorologists look at to predict severe weather is instability, or CAPE (Convective Available Potential Energy). CAPE is simply the fuel, or food, for thunderstorm development and maintenance. If CAPE is not present, it is typically much more difficult to get thunderstorms, especially strong to severe thunderstorms. 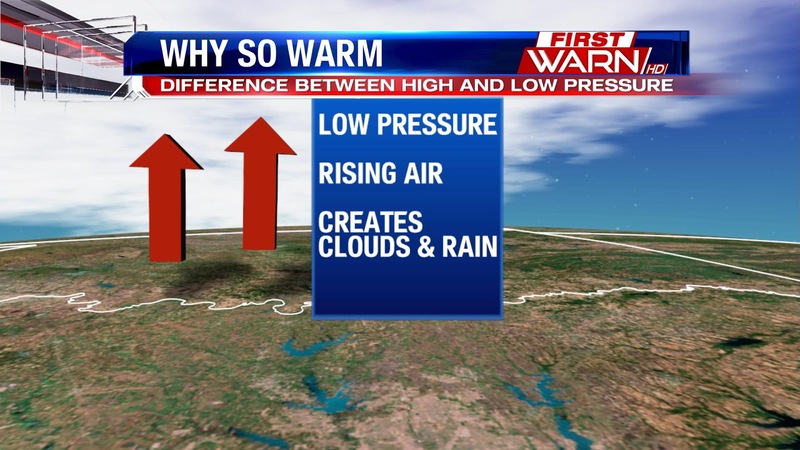 The cool temperatures disallow CAPE to be present because CAPE requires warmth, moisture, and sunshine to materialize. 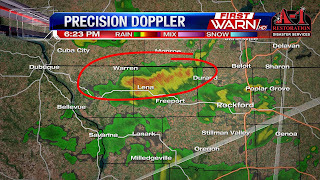 Those are three things the clouds and rain have prevented from being present here in the Stateline. You can see where the CAPE is tonight by looking at the above map. There is simply no CAPE here because of the clouds, cool temperatures, and showers. So, yes, we are seeing a lack of severe weather here locally, but severe weather is happening -- just a few hundred miles south. We can thank the unseasonably cold temperatures for that! Just How Chilly Has it Been? 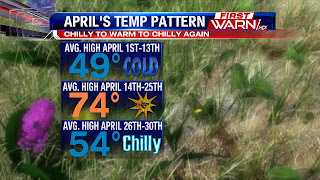 Now that we are heading into May in a few days, let's reflect on what April brought in the temperature department. Well, it was a month divided into three sections. The first 13 days of the month featured an average high of only 49°. Then, a big-time omega block set up and delivered a stretch of days that amounted to an average high of 74° from the 14th through the 25th. Now, as we round out the month, our average high for the last five days of April will likely come out to be near 54° thanks to enhanced cloud cover, rain, and a stubborn front that has been to our south. In spring these types of patterns are not abnormal. The cold of winter is battling the impending warmth of summer, so temperature fluctuations are actually normal occurrences in March, April, and to an extend May. Speaking of May, where do we head in the temperature department as a new month roles in? Well, a trough feature will be persisting across the Great Lakes region through the first week of May, which will result in below average temperatures here in Illinois and Wisconsin. However, they won't be quite as chilly as they have been recently. 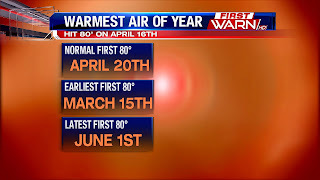 Nonetheless, we won't be seeing a return of those beautiful 80-degree temperatures anytime soon. We've been lucky this month for many nice weekends, but this weekend we'll see a soggy and cooler trend than what we were used to for most of the month. An area of low pressure that is currently spinning in Kansas and the central plains, is already firing up showers and storms across portions of Texas, Oklahoma, Kansas, and Mississippi. The low pressure will track across central Illinois, which means that northern Illinois and southern Wisconsin will be on the cool side of the low. This means that our storm potential is low, with more of the warmth and instability south of the region; but we will see rain as well as cooler temperatures because of it. Watch for the rain to move in around noon on Saturday that will lift northward, sticking with us through the afternoon. Rain turned more scattered into the evening and things dry out overnight. It is definitely a day to maybe pick a show to binge watch, or maybe even start some spring cleaning! Rain totals for Saturday look to be around an inch in central and southern portions on the state, while we look to see closer to a half inch. Along with the rain, it will also be windy too with chilly easterly winds gusting to 30mph. Sunday will be more of a pleasant day but still cooler. There is a small chance we will see a couple lingering showers, but mainly it will be a cooler day with mostly cloudy to partly sunny skies. The forecast gets better though, as Chief Meteorologist Candice King mentioned in the previous post, 70's are possible next week! The month of April has had its ups and downs with the weather. From summer-like warmth to snow flurries, we've had quite the extremes over the Stateline. The end of the month will be cooler with highs over the weekend staying in the 50's, still ten degrees below average. But by next week there are some signs that the 60's, and possibly even 70's, will return. But the extent of the warmth depends on the just how the jet stream behaves. As Meteorologist Kristin Cwynar explained in the previous post, the outlook for the first week of May looks a little more promising. 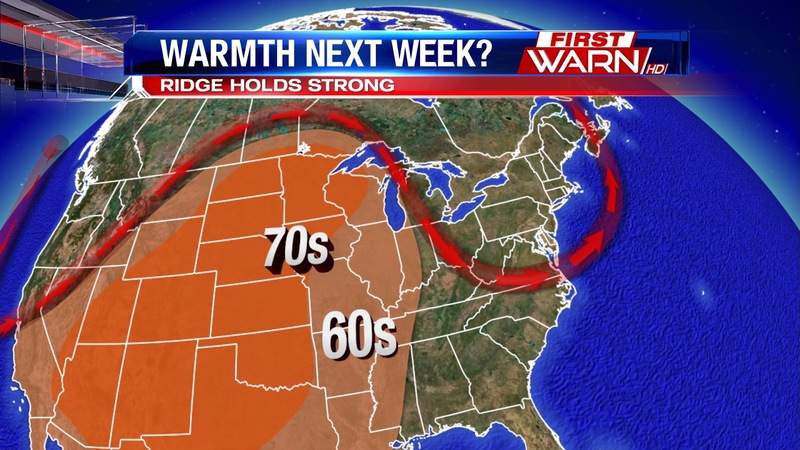 The jet stream will buckle over the middle of the country with warmth expanding into the Northern Plains and Canada. 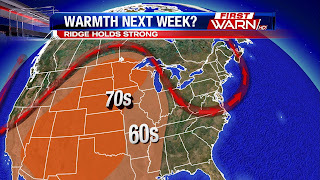 That warmth gets pushed east over the Upper Great Lakes thanks to west winds during the beginning of next week. Each day, highs will warm through the 60's possibly reaching the 70's by next Tuesday and Wednesday. However, the 70's may be hard to achieve if the ridge of high pressure isn't quite as strong. This could be the case as a trough of low pressure develops over the Northeast. That trough could kink a little further west over the Western Great Lakes pulling down a slightly cooler air mass towards the middle to end of next week. So for now, I left highs in the 60's and if the Northeast trough doesn't look too strong in the days to come we could warm those highs in the 70's. Fingers crossed! It's been a damp and chilly end to April this week, as high temperatures stayed below the average 65°. We can expect below average temperatures through the weekend and into next week as well, but highs will be warmer than what we saw this week. 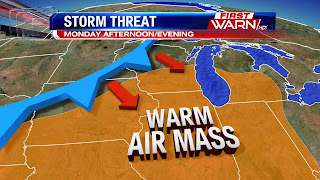 A ridge of high pressure will build across the west allowing the warmth to build, as a trough or dip in the atmosphere sets up across the Midwest and east coast. This will allow cooler air to filter into the area through most of next week. The cooler outlook have been outlined be the Climate Prediction Center for the week of May 3rd through the 7th, as these signs point to a cooler start to the month. East winds, cloud cover and rain have done nothing for our temperatures Wednesday afternoon. Highs reached the low 50's - still 10 degrees below average - but once the rain came in temperatures dropped into the low to mid 40's. Unfortunately it's going to be hard to get much rebound for the rest of the afternoon. The good news is the rain will be ending for nearly all of Northern Illinois by 7pm as drier air gets wrapped in ahead of low pressure to the west. 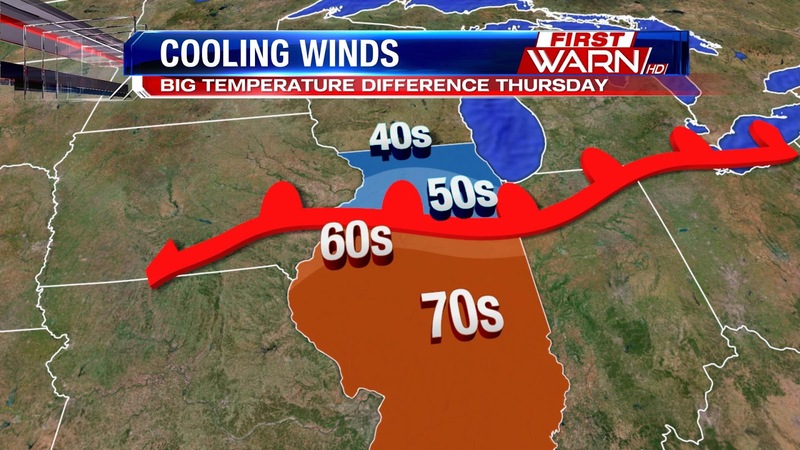 We've stayed on the cooler side of the front, but temperatures in Central Illinois warmed into the 60's. The reason, a warm front in the middle of the state. 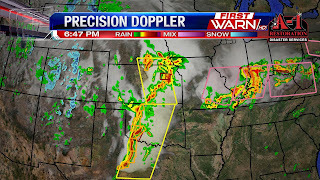 This warm front is attached to an area of low pressure currently moving into Northwest Missouri. 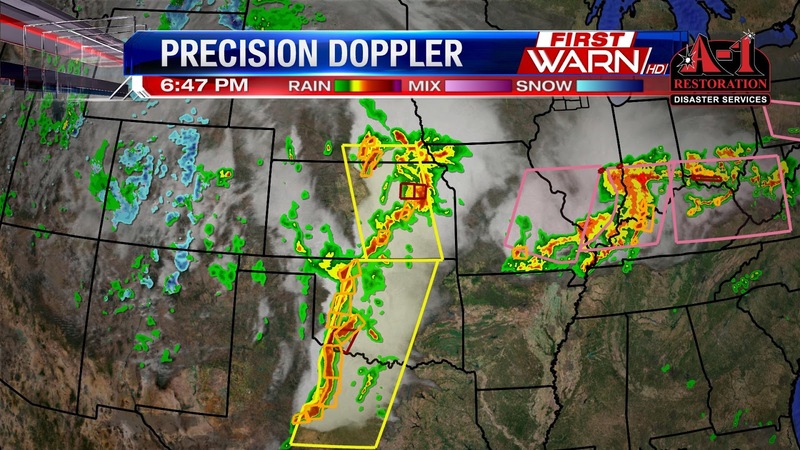 Ahead of the low the air mass has destabilized enough to produce multiple severe thunderstorms with several tornado warnings in Southwest Iowa and Northwest Missouri. Eventually the severe threat will end to the west as the low pressure tracks east overnight. 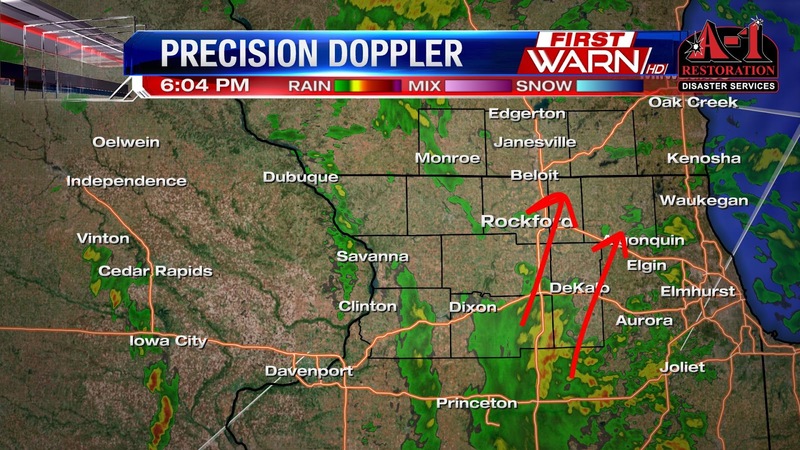 This low will stay to the south of Rockford keeping us on the cooler side. Thursday will be another chilly day with highs struggling to get out of the 40's for most. But like today, south of the front highs will warm into the 60's and 70's. The East wind sticks around through the weekend which will hold temperatures slightly below average through at least Sunday. Two separate storm systems are producing severe weather Tuesday evening. The first from what developed late Monday night now moving into Southern Illinois with severe wind gusts and large hail. The second storm system out west has produced several tornado and severe thunderstorm warnings from Nebraska to North Texas. That system shifts east overnight Tuesday and is what will bring Northern Illinois and Southern Wisconsin rain Wednesday afternoon and Thursday. Don't worry - we will not get any severe weather. We stay on the 'cooler' side of the storm with a stiff East wind Wednesday. This will hold temperatures in the low 50's for both Wednesday and Thursday afternoon. 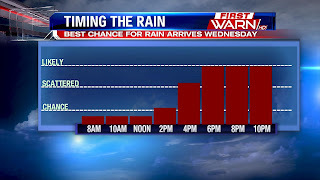 Light rain moves in Wednesday afternoon, becoming a little more steady by Wednesday night. As Meteorologist Kristin Cwynar mentioned in the previous post our April rainfall has fallen below average with us now over an inch below our monthly rainfall total. The incoming rain will help, but most models average out about half an inch between the two days. Which leaves us still over half an inch below what we need. There is some rainfall for the upcoming weekend which may help a little, but it's possible we'll end the month on the dry side. As we round out the month of April, looking back it's been a fairly dry month. In terms of our average, we are about an inch behind. Currently looking at 1.77" compared to 2.77" Though we only have about a week left, multiple rain chances will help get us closer to our monthly average. us just to the south. Northern Illinois will be on the northern or cooler side of the low pressure system as it passes, so while we have scattered showers in the forecast, the thunderstorm threat will be low. 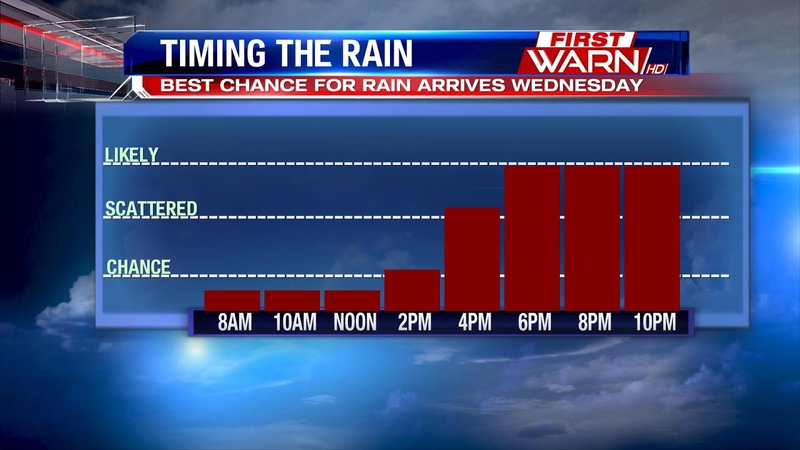 It will be a dry commute on Wednesday but once we look to just after the lunch time hour, the rain threat ramps up. Watch for showers between 2-3pm to start increasing in coverage. Multiple round of rain possible into the evening and overnight as well. A quick check of the 7-day shows a dry Friday but anther threat for rain both Saturday and Sunday. However, models are still disagreeing on the timing of another low pressure system, so the weekend outlook could still change. Severe threat shifting east with cold front approaching. 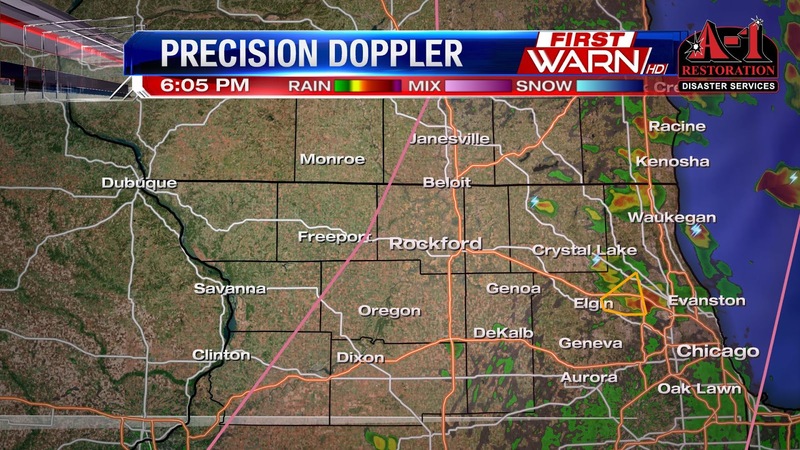 There may be a few showers, isolated storms, south and east of Rockford but our storm threat is coming to an end. We will likely continue to see the watch canceled early for the remaining counties over the next couple of hours. 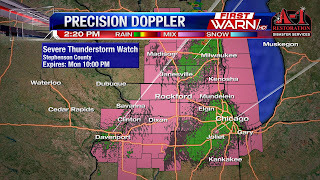 Severe Thunderstorm Watch continues for most of Northern Illinois and Southern Wisconsin, but has been canceled for Stephenson, Carroll and Green counties. Storms now mainly east of Rockford and moving towards Chicago. Storm threat likely over around 7pm this evening. Thunderstorms continue to quickly develop ahead of a cold front late Monday afternoon. Already a severe thunderstorm warning had been issued for Boone and McHenry counties with pea sized hail reported in McHenry and Woodstock. 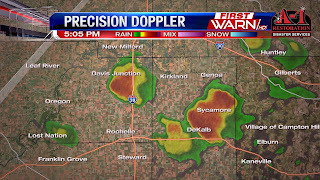 Additional thunderstorms moving into Davis Junction and the DeKalb/Sycamore areas could contain pea sized hail. 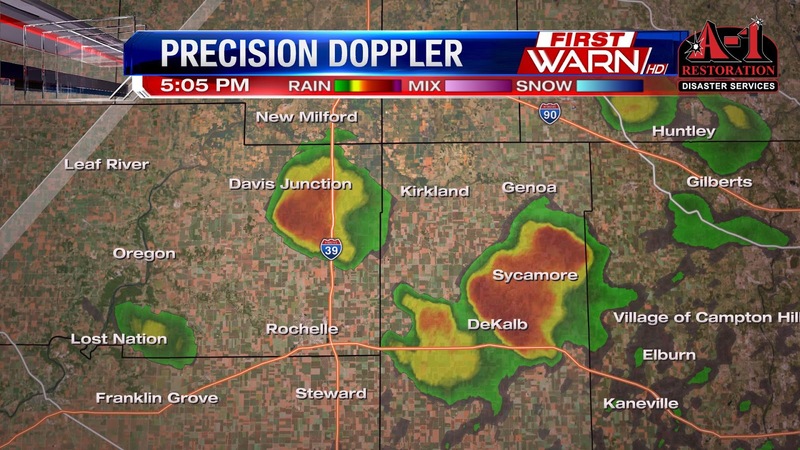 However, the storm moving over Sycamore could produce hail up to nickel sized. 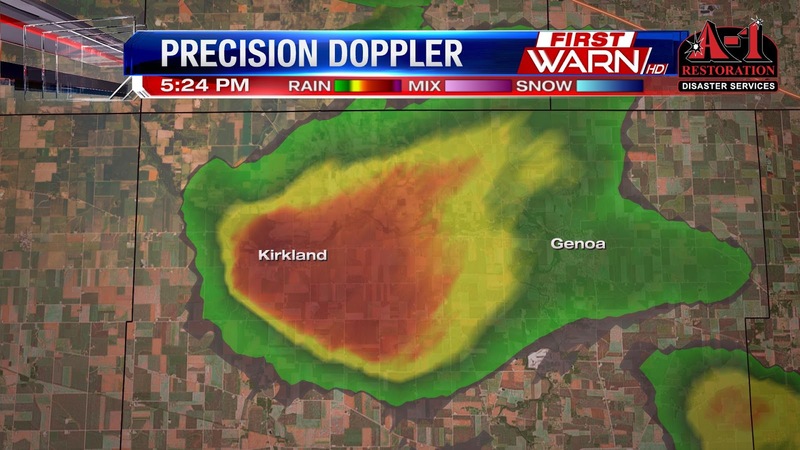 This particular cell is moving to the east at 35 mph. Wind gusts up to 55 mph will also be possible. Once the front passes by 8pm, our storm threat will quickly decrease. 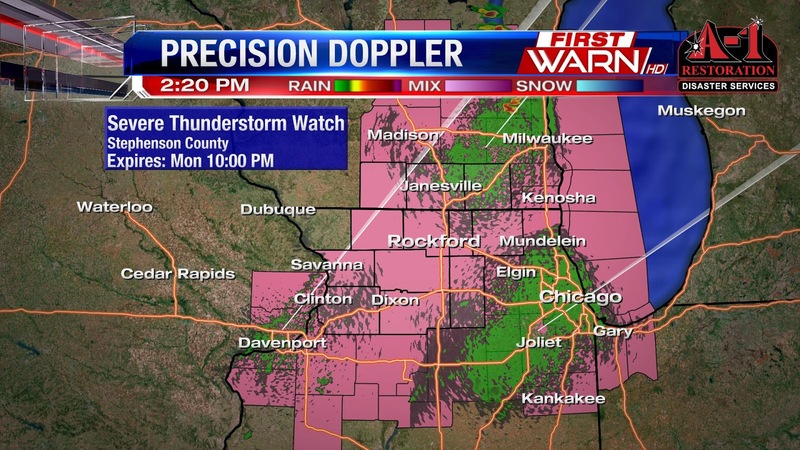 A Severe Thunderstorm Watch has been issued for Southern Wisconsin and Northern Illinois until 10pm Monday evening. Temperatures have warmed into the upper 70's and low 80's this afternoon with dew points climbing into the middle and upper 50's. This combined with a cold front moving through during the late afternoon and evening will likely produced a broken line of strong to severe thunderstorms between 3pm and 5pm over Southern Wisconsin and Northern Illinois. Initially, the storms may form individually giving a higher threat to large hail. By the evening, storms will progress into a line with a wind threat becoming the most dominant threat. 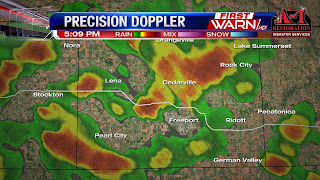 This will likely occur east of Rockford. The image to the left is a simulated radar image at 4pm. Be prepared for quickly changing conditions this afternoon and evening. And make sure you have a plan in place if you're going to be out later today to take shelter. A strong cold front is currently west of northern Illinois, in western Iowa. 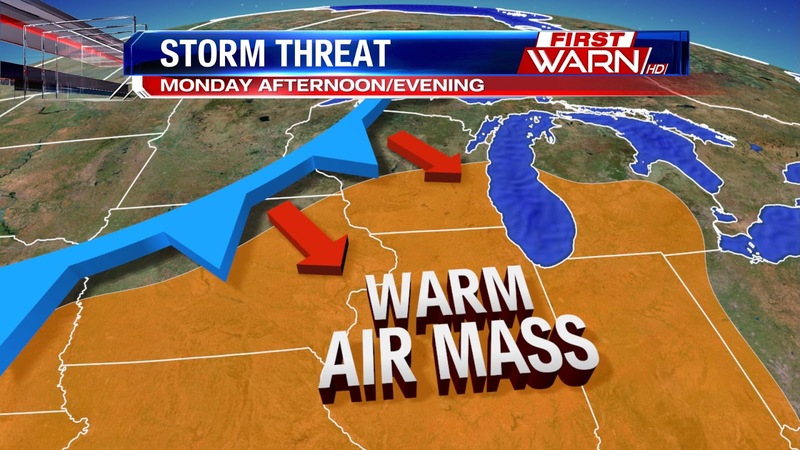 Ahead of the cold front, northern Illinois and southern Wisconsin are situated in the 'warm - sector ' of the system. Allowing for strong southerly winds to boost temperatures into the upper 70's and low 80's, along with increasing moisture/dewpoints into the mid and possible upper 50's. Despite some cloudiness this morning, clouds have cleared a bit and this will add to the instability in the atmosphere, needed for thunderstorms. The more sun we see, the more instability we will gain. Other thunderstorms parameters are in place this afternoon, as the cold front sinks closer to the Stateline. Most of the day will be dry, but once we get closer to 4pm, this is the best timing for a broken line of storms to fire up and head southeastward through northern Illinois and southern Wisconsin. The Storm Prediction Center has outlined the area under a Slight Risk for strong to severe thunderstorms. The best timing of these would be between 4-8pm and the primary concerns in any of these storms would be large hail and damaging winds. With the area under a slight risk, do think one or two storms will be on the stronger side, but not all. As we enter into the final week of April, Mother Nature will be ramping up the threat for severe weather, with the first round coming Sunday afternoon and evening. The first of two systems now moving over the center of the country has caused a line of thunderstorms to develop from western Iowa into eastern Kansas Sunday afternoon. Numerous severe thunderstorm warnings and tornado warnings have been issued within this line. This low pressure system will track northeast tonight into Iowa and Minnesota, and then into Wisconsin by Monday evening. Temperatures ahead of the low in Illinois and southern Wisconsin will once again warm into the 70's, and possibly low 80's. This will cause the air mass to become slightly unstable by the afternoon. Dew points will also be on the rise, so Monday may feel a little more humid than what Saturday and Sunday felt. A cold front will move southeast after 3pm/4pm Monday towards Northern Illinois. 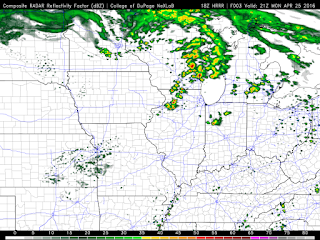 This front may be the trigger needed to develop showers and thunderstorms by the evening. While the severe threat will be low, it's not zero. A few gusty thunderstorms are possible Monday late afternoon and evening, with hail and wind being the primary threats. Once the front passes Monday night, our storm threat will decrease. The second storm system that will bring even a greater threat for severe weather over the center of the country is moving onshore in the west. It's this storm system that will bring an increased threat for severe weather for places like Kansas, Oklahoma and Texas Tuesday afternoon and evening. That storm threat will shift east with an advancing low pressure system on Wednesday affecting Missouri, Southern Illinois and Arkansas. Northern Illinois and southern Wisconsin will remain north of the more unstable air mass which will likely keep our storm threat low. Below are the convective outlooks from the Storm Prediction Center for this week. Definitely a much more active week ahead. Summer-like temperatures will make a return on Sunday and Monday with highs pushing into the upper 70s to near 80°. Partly cloudy skies are expected on Sunday as we remain dry. A stationary/hybrid cold front will sag south towards the region on Monday. A low pressure system will also approach from the west. These two features will support scattered showers and even some thunderstorms Monday afternoon and evening. Humidity values will be up on Monday as well, with dew points possibly exceed 60°, which will be one of the more humid days of the year so far. However, the threat of severe weather looks very low to near zero on Monday. That front will be a very big player in terms of temperatures next week. Once it moves through late Monday night, temperatures could fall 10-20° in a matter of minutes as winds shift to northerly and cold air filters into the region from the north. 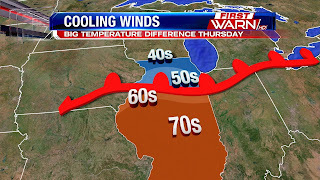 The front itself will likely reside just to our south Tuesday-Thursday, which means we can expect much cooler air in the Stateline as opposed to the 70s and 80s for Central and Southern Illinois. High temperatures next Tuesday, Wednesday and Thursday will likely stay in the 50s to potentially 60°. That large temperature gradient will play to our benefit come Wednesday as a very potent storm system tracks towards the state. It will bring powerful storms and tornadoes to portions of the Plains on Tuesday. That severe threat pushes east on Wednesday to include portions of Illinois. Due to our location north of that stationary front, though, we will be too cool and stable to see that severe threat this far north. The exact location of that front could change between now and next week, so it is something we will have to continue watching, but for now the severe threat here in Northern Illinois and Southern Wisconsin looks very low. This year has gotten off to a relatively slow start in the severe weather department across the country. That statement is especially true for Northern Illinois and Southern Wisconsin. 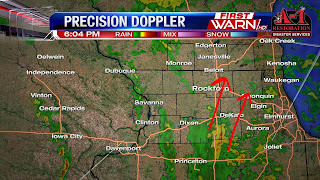 We have not really entered a favorable pattern for severe weather in the Stateline yet. That could change next week. For those in the Southern Plains and Missouri Valley, it will change. A strong low pressure system and associated negatively tilted trough will eject out of the Four Corners region Monday. The low will rapidly strengthen and pull in plenty of warm and moist air from the Gulf of Mexico. That moisture-rich air will interact with cold air aloft back in the Rocky Mountains, in addition to very strong winds aloft, and create an environment highly favorable for severe weather. The main area of concern for severe weather will be in Oklahoma, Texas, Kansas, and Missouri on Tuesday. However, the system will lift to the northeast into Wednesday, taking the severe weather threat with it. That will bring the chance of severe weather to areas in Iowa, Illinois, Missouri, Arkansas, and Southeastern Oklahoma Wednesday into Wednesday night. That threat does not appear as robust as Tuesday's threat simply due to less favorable conditions. Nonetheless, a legitimate and possibly significant severe weather event is a good possibility on Wednesday. The northern extent of the severe weather will be determined by where exactly the low and its associated warm front track. If that front ends up over or just north of the region, we will be in the "warm sector" of the system. As a result, severe weather would be a concern. If we end up north of that warm front, we will be in the cold, stable portion of the system. That would mean highs in the 50s and no severe weather threat. At this time, models are leaning more towards highs in the 50s and lower 60s with the severe weather threat remaining just south of I-88 and the Stateline. It is something we will have to watch because if the models start trending that warm front further north, we could be dealing with a severe weather day next Wednesday with all forms of severe weather (damaging winds, large hail, tornadoes, flooding) possible. Cold front passing this morning is what is bringing the stratus deck of clouds, but they won't stick around all afternoon. There will be gradual clearing in the late afternoon and into this evening as well. However, as skies clear overnight, temperatures will fall into the mid 30's as cold air filters in behind the cold front. With temperatures in the 30's patchy frost is possible across the Stateline, especially near the Wisconsin border. This is where the National Weather Service has issued a frost advisory that will go into effect at 1am and will continue until 7am Saturday morning. You'll want to cover up and sensitive plants before you head to bed tonight! 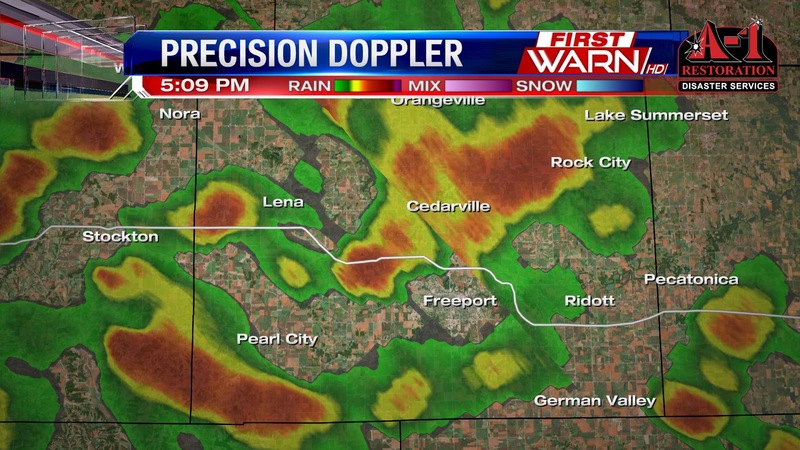 Heaviest rainfall has been falling along and north of Highway 20 in Stephenson County. Rainfall totals in that area will likely be closer to one inch where the heavier rainfall has been occurring the longest. Additional showers will continue over Northern Illinois until the low passes later tonight. Heavy rainfall will be the greatest threat. Thunderstorms are now building south of Chicago. 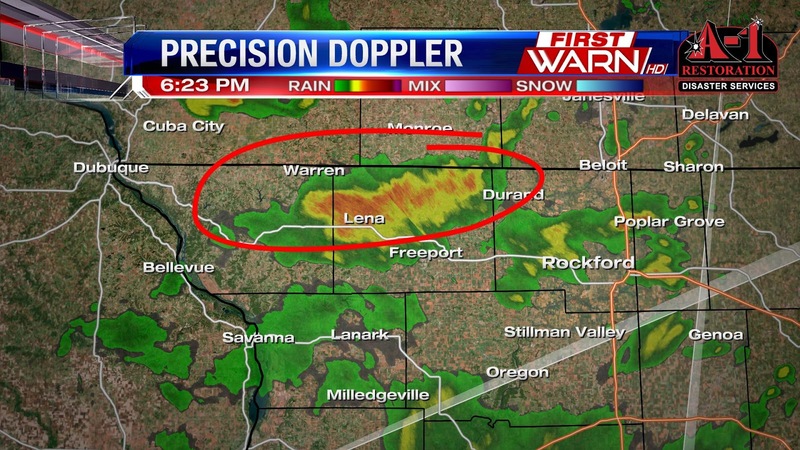 Our First Warn Weather Watcher Tony Honchar in Freeport has recorded 0.35" of rain so far. Heavier rainfall will produce totals close to half an inch. Scattered showers and thunderstorms have developed ahead of a strong upper level low in southern Iowa. 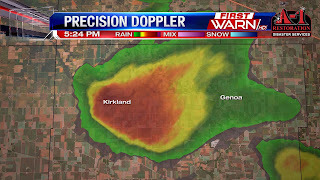 Storms in eastern Iowa earlier in the afternoon produced pea sized hail, but as the rain moves into more of stable air mass over Northern Illinois the lightning strikes have diminished. Still, heavy downpours and small hail will be the greatest threats through 8pm/9pm Thursday evening. Severe weather is not expected. Once the low passes late tonight the threat for rain will decrease. It's a foggy Thursday morning with greatly reduced visibility across portions of the Stateline. 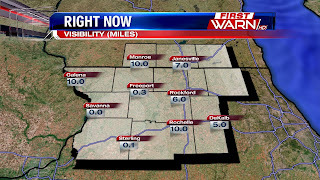 The thickest fog is found west of Rockford through Freeport, Sterling, and Savanna where the visibility has hoovered around a few hundred feet. The low pressure system is currently situated in western Iowa, and with the warm front to the north of us we are in the warm sector of the system. Morning temperatures starting warm in the mid and upper 50's this morning. With the clouds breaking apart through midday and early afternoon, temperatures will be very similar to yesterday where we warmed into the upper 60's and even low 70's. With the sun warming the surface, up above in the atmosphere there is a pocket of cold air. What this does is creates a big difference in temperatures, or a large temperature gradient. This in turn helps to generate instability which is a big ingredient for thunderstorms. With more lift in the atmosphere arriving in the mid to late afternoon, and with increasing instability storms and showers will be possible for us late in the afternoon today. It won't be a wash out however, but watch for isolated storms around 4pm and will continue into the evening. Don't worry sun returns on Friday and temperatures continue to warm over the weekend. Now I have the song 'Walk the Line' by Johnny Cash stuck in my head. But, that's pretty much what we'll be doing early next week. Okay, maybe not literally walking the line but a stationary front will bisect the state line with temperatures north of the front in the 40's and 50's, while south of the front the 70's will be felt. Once we get past this cut-off low by Friday, our skies will dry and we'll see more sun into the weekend. Temperatures will also climb into the low 70's by Sunday as high pressure slides into the eastern Great Lakes. This will cause surface winds to shift around to the south, giving temperatures the nice boost to end the weekend. By Sunday night, an area of low pressure will begin to move through the Plains. As it does, the warm front will slowly begin to sag south through Wisconsin. Shifting winds to the north behind the front will pull down cooler air while the air mass south of the front will continue to warm. Right now it looks as if cities in southern Wisconsin could be in the 50's with cloudy skies and rain, while cities in northern Illinois warm into the low to mid 60's. For our far southern cities like Amboy, Paw Paw and Sublette highs could be close to 70 degrees. We've still got a few days for the front to move, but let's hope we stay on the warmer end - at least for Monday. It does look cooler Tuesday with a more active pattern taking shape. Most of Wednesday ended up dry and that dry weather gave temperatures a nice boost into the upper 60's and low 70's. Much improved from the all day 50 degree weather Tuesday. There have been a few light showers Wednesday late afternoon, but I anticipate the rain to pick up a little more in intensity through the evening. Thunder has been hard to come by as instability has stayed low, so just expecting light rainfall through the evening. Rainfall amounts won't be much - quarter of an inch for some. As drier air moves in overnight the rain will be ending through Thursday morning. And like Wednesday, Thursday will see many dry hours. As an upper level low pulls closer to Northern Illinois late Thursday afternoon, an uptick in showers and thunderstorms will be possible. This will be due to colder air found above the surface of the earth associated with the low. With a little sun Thursday afternoon, the colder air will help generate instability. 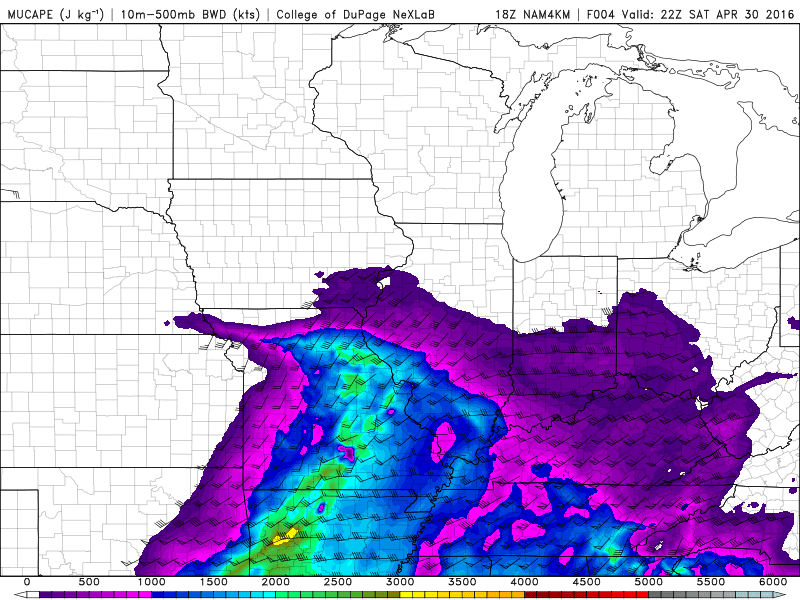 And that instability will lead to a slightly higher storm threat Thursday afternoon. But don't worry, the showers/storms will be isolated. A few showers may linger into Thursday evening before skies dry by Friday morning. ..with a 20° degree temperature drop today. A 'back door' cold front pushed southward overnight that will drop high temperatures today. Yesterday afternoon we made it to 83° but no such luck for today. With cooler air advecting in behind the cold front with easterly winds, temperatures today will only warm into the lower 60's. We also don't have the sunshine today like we did yesterday, so that will also hinder how warm we get, combined with rain showers this afternoon. Despite the big drop in temperature, there is still a silver lining. Our temperatures the next few days will still be above the average for this time of year which is 62/63°. How Unusual is 80° in April? We have now seen three straight days with temperatures in the 80s after beginning last week in the lower 50s! The warm up has been courtesy of a dominant area of high pressure causing what meteorologists refer as the "Omega block" to develop. Once that set up in the Great Lakes, sunshine and southerly winds moved in, allowing temperatures to increase each day last week before hitting the 80s Saturday, Sunday and Monday. Those 80s were a good 20 degrees above normal for this time of year. And we won't be seeing temperatures that high for awhile. first 80-degree day on April 20th. This year, that happened on April 16th, 17th and 18th. That is only four days off of the average first occurrence of 80°. 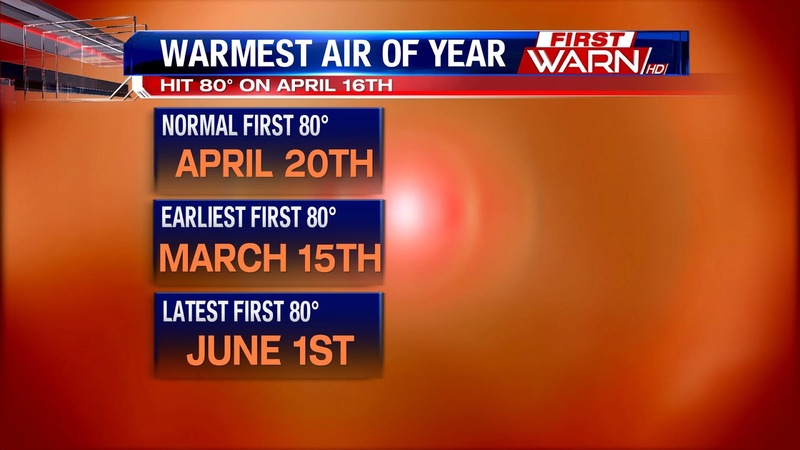 We have hit 80° as early as March 15th, and we've gone as late as June 1st without seeing 80°. So, if you're wondering whether seeing the 80s is unusual for this time of year in Northern Illinois, the answer is not really. What is slightly abnormal is the fact that we saw three straight days in the lower 80s. Typically in mid-April, these types of warm ups are a one or maybe two day thing as colder air usually prevents them from lasting much longer. Hopefully you enjoyed the 80s because we may not be seeing them for quite some time! To answer this question, we have to look at what's happening above our heads. A blocking high pressure system has been stationed over the Great Lakes, while an upper level low has been spinning out west. Air throughout the atmosphere is sinking under high pressure. When air sinks, it compresses causing the air to warm. Sinking air makes it difficult for clouds to develop and this is typically why when under high pressure there are very few clouds around. The opposite is true for low pressure. Low pressure causes rising air throughout the atmosphere. As the air rises from the surface, surrounding air tries to 'fill in' the lower pressure. This causes clouds to form which eventually lead to rain and thunderstorms (or if it's cold enough, snow). Since we've been under high pressure for several days, our temperatures have warmed each and every day. We continue to add warmth into the atmosphere which continues to heat our surrounding air. Monday the Great Lakes will still be under the influence of high pressure, but the cut-off low to the west will be inching closer. This will cause a little more cloud cover to develop by suppertime Monday evening and ultimately bring an end to our 80 degree stretch (but not before we hit another 80 degrees Monday afternoon). Thundershowers will be a little more likely by Tuesday morning. How Long Can We Stay Dry?